In spite of the (well-deserved) international fame of Mexican sweet bread, bolillos may well be the most Mexican bread of all. A bolillo is a small loaf (about 6 inches long) of plain white bread, crusty on the outside and with a soft interior. It is the type of bread most often used to accompany Mexican meals, and it is definitely an integral part of the everyday food scene in that country. Bolillo is the bread most often used for making molletes and tortas, it is routinely cut into slices and served in a basket with a meal (instead of tortillas), and it’s the obvious choice for a bread to enjoy with butter as part of a breakfast, lunch, or dinner. Bolillos became popular during the 19th century, a time when French influence was great in Mexican politics and culture—a fact attested to by the nickname it is given in some parts of the country: pan francés (French bread). Loaves very similar or identical to bolillos in composition but slightly different in shape are known as teleras and birotes. Despite its popularity, most Mexicans never have baked their own bread at home; both sweet and savory loaves have always been acquired mainly from local bakeries or directly from people selling it door to door, often from a large, shallow basket affixed to a bicycle or, in more modern times, from the trunks of their cars. In recent decades, bakeries inside of large supermarket chains have pushed out a large number of local neighborhood bread-making businesses, but the popularity of the loaves themselves has never waned. Bread baking is definitely both a science and an art, and it can take years to master it at home, where the dough additives and special equipment available in a commercial kitchen do not exist. 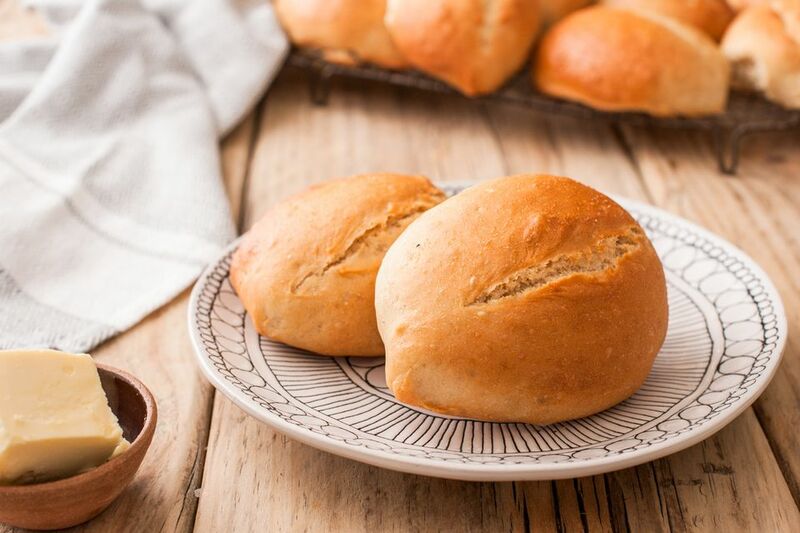 Below is a good beginner recipe—very simple to make with only 6 ingredients and only a bit of kneading—for those who cannot purchase bolillos where they live or who just get the urge to make their own. Pour water into a large mixing bowl, and sprinkle yeast onto the surface of the water. In a separate mixing bowl, mix flour, salt, and sugar. Add flour mixture to water a little at a time, mixing until a dough forms. Place dough in a greased bowl, cover with a towel or cloth and leave in a warm place for about an hour. Remove dough from bowl, punch it down and knead for about 10 minutes. Divide dough into 10 balls. For oval-shaped rolls (the usual bolillo shape), roll the balls between your palms for about 5 seconds to make a cylindrical shape, tapering slightly at the ends. Place pieces on one or more baking sheets. Cover and let loaves rise again for about 30 minutes. Brush each dough ball with egg white. Score each roll with two, 2-inch lines along the top, about 1/4-inch deep. Bake loaves for about 30 minutes. Remove from oven; cool slightly and eat warm, or let cool completely and store tightly covered. Did you know? The soft, doughy insides of a bolillo are known as the migajón. The migajón is often pulled out and discarded when turning a bolillo into a torta or when using the bread to push food around on a plate, leaving the firmer outside layer of the loaf to do the job.